Norton F1 Review【 Modern Classic 】All you need to know! Unique and exclusive, Norton’s hand-built rotary-engined race-rep is fabulous if flawed. It’s certainly the strangest British superbike of the 20th century. Nearly three decades later, how does it stack up? Rotary engines were the next big thing back in 1929 when Felix Wankel first ditched reciprocating pistons which whizz up and down, and replaced them with a multiple-lobed rotor that whirls round and round. By 1957 he’d built a prototype for NSU, and demonstrated that the rotary motor could be more compact than a conventional internal combustion engine while revving smoothly and safely to enticingly high rpm. Wankel’s engine also achieved an impressive power-to-weight ratio. Following this promising beginning, automotive manufacturers have been trying to make the rotary engine work ever since. In the early 1970s, BSA-Triumph figured the rotary motor might again be the next big thing, and then Norton-Villiers-Triumph developed that twin-rotor project into possibly the next big thing for 1975. By 1981, amid the collapse of the old British bike industry, Norton had pretty much given up any aspiration toward the next big thing. They clung to the slim chance that a utility machine, intended for police and military fleets and powered by an air-cooled rotary engine, might keep the company afloat while it developed the next generation of customer bikes. So Norton built the faired Interpol II, then the limited-edition, traditionally-styled Classic, and then the all-enclosed water-cooled Commander. You’d be forgiven for not recognising any of these models: fewer than 800 were built between 1983 and 1994. The F1, on the other hand, is instantly recognisable. Its racing counterpart, the RCW588 swooped to success in Formula One in 1989 with Steve Spray at the helm, attracted sponsorship from tobacco giant John Player, and went on to win the Senior TT and the BSB Championship. Even if you’re only a tiny company operating out of a big shed in Shenstone, it makes sense to capitalise on such racing achievement with a customer machine. Enter the street-legal, liquid-cooled F1 in 1989, a reworked version of the RCW. The F1 adopted the JPS livery of black, gold and grey, blended with the fashionable square headlight and wraparound bodywork of the day a la Bimota DB1, Ducati Paso and even that brand-new game-changer, the Honda CBR600F. Black wasn’t considered a particularly attractive colour for a sports motorcycle at the time (go figure), but the Norton’s high-class colour scheme makes that 80s styling seem less incongruous than it can be on the bright red bikes. The hand-crafted fibreglass bodywork has stood the test of time, too; accidental damage aside, most F1s still exhibit their deep lustrous finish on panels which fit together seamlessly. Genuinely hand built with a superb specification, a Spondon frame and top quality components, the F1 is a complete quirk of history. It’s a landmark motorcycle that is utterly unique, an astonishing achievement for any manufacturer – never mind one on the brink of bankruptcy. Just 140 F1s were made between 1990 and 1992, followed by 70 or so F1 Sports before production ceased in 1994. A price tag of £12,700 put the F1 beyond the reach of most British motorcyclists, but it wasn’t especially extreme for that class of exclusive machine – Yamaha’s OW01 retailed at £13,700, while a Bimota would cost a fair bit more depending on spec. Honda’s RC30 / VFR750R was a chunk cheaper at £10,600 new, but there were 3000 of the things in circulation, not 140. So you might think that an F1 would today be worth far more than an RC30, but that’s not how things have shaken out. You’ll pay much the same for either machine: at least £20,000, and half as much again for a minter. There are many more Hondas to peruse, of course; just one or two F1s are offered for sale each year, usually at auction. At low revs you’ll wonder what all the fuss is about. Below 4000rpm the F1 is slightly so-what; it certainly sounds weird but its acceleration is far from wild. An F1 covers a standing quarter mile in 12.47 seconds – almost half a second slower than a contemporary CBR600F, despite the Norton having a 10 horsepower advantage. Then you meet the F1’s massive, free-flowing mid-range and suddenly your surroundings blur into insignificance. An abundance of torque peaks at 60lb-ft at 7500rpm, but you won’t notice the numbers because the rotor motor is so ridiculously easy to rev. The F1’s 750/4 rivals produced less torque and you had to travel 2000rpm further up the rev range to find it. That stepless, surging power delivery makes the F1 easier to ride on open roads than many race replicas of its generation: the mid-range is more usable than on a typical race-bred homologation special. This machine doesn’t require constant cog-swapping to keep it on the boil in a tiny powerband. You’ll find peak power of 95bhp at 9500rpm but you’ll need to grab a glance at the clocks to be certain, because you won’t feel a thing through the bars or footpegs. This engine genuinely is so smooth – no vibes, no power pulses – that you can balance a 50p piece on the petrol tank while revving the bejaysus out of it (the limiter will prevent disaster by chipping in at 10,500rpm). Breath-taking roll-on acceleration aside, you’ll be howling around in fourth gear just to listen to the awesome sound effects from the F1’s intake and exhaust. It’s the closest you’re ever going to get to two-wheeled jet propulsion, and is the reason why owners are prepared to put up with the bike’s less well-mannered behaviour around town. Engine braking is akin to a big two-stroke or a 250/4: it’s significant but not substantial. Some of the F1’s unique engine components have, inevitably, become very scarce but there are a few specialists with the technical know-how who can maintain the motor, and a core of committed owners who occasionally finance small batches of key components. The rotary engine burns its oil much like a two-stroke does, using about a litre in a thousand miles. It is sensitive to the individual brand, so owners need to use one lubricant consistently or flush out the system before swapping to a different type. The gearbox and primary drive use separate oils so need checking at service intervals. The Yamaha five-speed gearbox is slick but its ratios aren’t ideal for the F1’s 95bhp output. The box was built to work with the FZR1000’s 125bhp, leaving some wide gaps between the lower gears on the Norton. The F1 also displays the rotary engine’s least attractive habit of juddering on the overrun; the audible indication of backlash in the rotor motor’s transmission when the engine’s not under load. They all do that sir but it sounds alarming, and you typically notice it when slowing to a stop… when you might imagine it’s eating its own extremely expensive intestines. 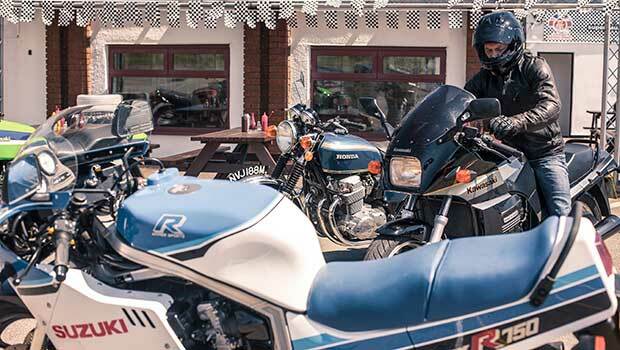 Making a clean getaway is challenging because the action of the 18-plate wet clutch leans towards the savage side of things, and it’s compounded by some stuttering from the pair of downdraught 34mm Mikuni carbs. The F1’s carburetion can be tricky to set up and there’s a tendency for the engine to hunt and grab at low revs, much like early fuel injection systems. The upshot? It’s awesome on the open roads but a right prima donna at slow speeds in traffic. The combination of Spondon’s aluminium, twin-spar, perimeter frame and WP suspension provides superlative steering and handling. It’s precise and confidence inspiring, if a little weird in that the F1 has the physical feel of a litre-class hyperbike, not a titchy little 600. It’s admirably stable in long sweeping corners but won’t react to the merest blink from the rider to change direction – its 1440mm wheelbase demands more muscle than the shorter RC30, and the F1’s steering is less intuitive and user-friendly than a modern streetbike. Adjustable at either end for compression and rebound, the WP suspension is typically set softer for road use then stiffened to the max for track days. With the preload wound right down at the rear you get a comfortably soft ride, albeit at the expense of some precision at the front end under rapid acceleration. The USD forks retain their composure under even the heaviest braking on squirrely surfaces and, when new, the rear shock provided 143mm of travel – although many will need a rebuild by now. The bike is well balanced with 51/49 stationary weight distribution, but it’s peculiarly heavy for a motorcycle with an alloy frame and that supposedly lightweight engine. At 185kg dry it’s actually heavier than both the CBR600F and the VFR750R, with all their cylinders and pistons and such. By the time you’ve added oil and fuel, the race-replica F1 is actually 10kg heavier than the mass-market CBR. F1s can be sensitive to tyre choice, and certainly didn’t appreciate the Dunlops fitted when new, but as the 170/60 rear tyre sits on a 17-inch rim you have a decent range of rubber to choose from. Take great care over speed humps; the F1’s 175mm ground clearance evaporates when the expensive / irreplaceable stainless steel exhaust collector box senses an opportunity to generate a spectacular shower of sparks. The triple Brembo set-up is more than a match for the F1’s mass and momentum, and the dual discs with their four-piston calipers provide substantial stopping power. At high speeds, the brakes are brilliant. Around town – especially as Brembo’s floating mechanism ages – they’re a mixed blessing. Wear and tear on the discs’ securing pins (potentially combined with the 30 year-old discs warping) generates an oscillation in low speed braking that adds to the F1’s finickity traffic manners. No ABS, remember, so don’t be caught out by a sudden judder at a greasy junction. Once again, the F1 feels more like a big sportsbike than a compact RR by offering a surprisingly roomy riding position – yet one combined with a reasonably low saddle height of just 760mm. There’s adequate space to shuffle around between the forward-positioned handlebars and rearward footrests. Even so, it’s inevitably more comfortable at speed than tooling around town when the rider’s weight rests on the wrists. Similarly, the windscreen works perfectly if you adopt a racing crouch but in normal riding your head and hands will be exposed to the elements. Sidestand only. Instrumentation is minimal: speedo, tacho, temperature gauge and four idiot lights. The cockpit-positioned reserve petrol switch looks like an afterthought but functions fine. Zero luggage capacity. It’s easy now to find fault with the F1, and sneer at its shortcomings. Most modern middleweight roadsters could run rings around it – but that’s missing the point. In its day, the limited edition F1 was judged against the best that the industry giants in Japan and Italy could build, and it stood up to such comparisons. These days, it’s a one of a kind, a truly innovative engine in a stunning chassis. It happens to be a bit rough around the edges – which in classic circles is generally described as ‘character’. Owning one and riding it well requires some commitment, but an F1 is the kind of bike which inspires dedication among those people who learn to love it.